FAA Involvement The FAA has had a formal involvement in this issue since 1988. That was the year the first Human Factors Issues in Aviation Maintenance and Inspection National Conference was conducted, and that effort reflects a working relationship between government research and industry activity. This yearly event includes airlines, suppliers, manufacturers, schools, and government agencies. 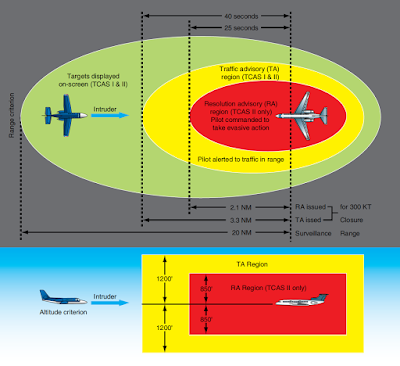 The greatest impact in aircraft safety in the future will not come from improving the technology. Rather it will be from educating the employee to recognize and prevent human error. A review of accident related data indicates that approximately 75–80 percent of all aviation accidents are the result of human error. Of those accidents, about 12 percent are maintenance related. Although pilot/co-pilot errors tend to have immediate and highly visible effects, maintenance errors tend to be more latent and less obvious. However, they can be just as lethal. 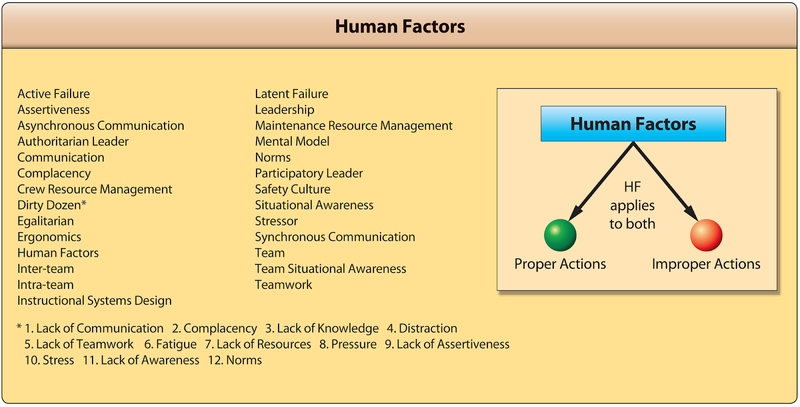 Our focus is on human factors as it relates to improper actions. Note, however, that human factors exist in both proper and improper actions. [Figure 1] Since improper actions usually result in human error, we should also define that term. Omission: not performing an act or task. Commission: accomplishing a task incorrectly. Extraneous: performing a task not authorized. Aviation safety relies heavily on maintenance. When it is not done correctly, it contributes to a significant proportion of aviation accidents and incidents. Some examples of maintenance errors are parts installed incorrectly, missing parts, and necessary checks not being performed. 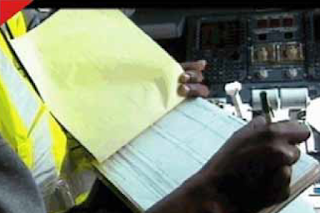 In comparison to many other threats to aviation safety, the mistakes of an aviation maintenance technician (AMT) can be more difficult to detect. Often times, these mistakes are present but not visible and have the potential to remain latent, affecting the safe operation of aircraft for longer periods of time. Human factors awareness can lead to improved quality, an environment that ensures continuing worker and aircraft safety, and a more involved and responsible work force. More specifically, the reduction of even minor errors can provide measurable benefits including cost reductions, fewer missed deadlines, reduction in work related injuries, reduction of warranty claims, and reduction in more significant events that can be traced back to maintenance error. Within this article, the many aspects of human factors are discussed in relation to aviation maintenance. 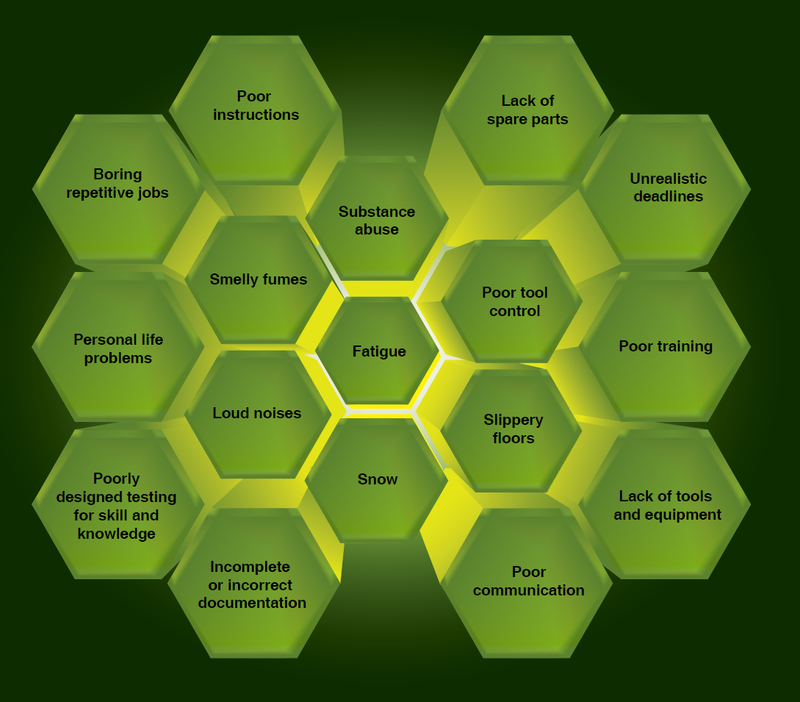 The most common human factors are introduced along with ways to mitigate the risk to stop them from developing into a problem. 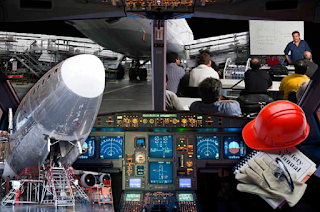 The term human factors has grown increasingly popular as the commercial aviation industry realize that human error, rather than mechanical failure, underlies most aviation accidents and incidents. 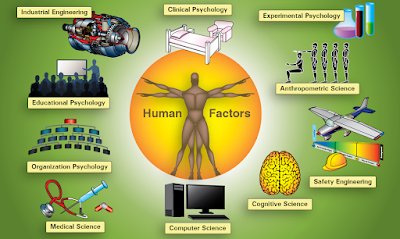 Human factors science or technologies are multidisciplinary fields incorporating contributions from psychology, engineering, industrial design, statistics, operations research, and anthropometry. 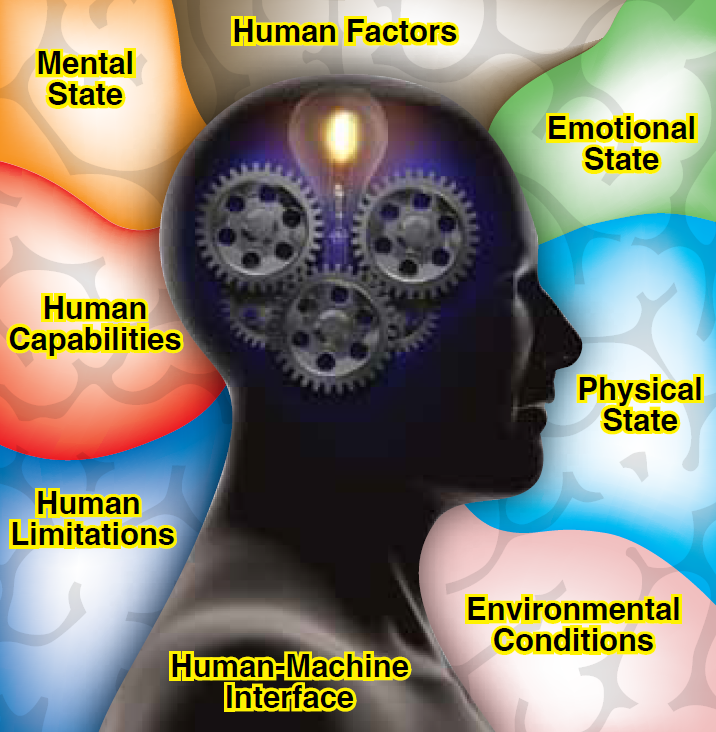 It is a term that covers the science of understanding the properties of human capability, the application of this understanding to the design, development, and deployment of systems and services, and the art of ensuring successful application of human factor principles into the maintenance working environment. 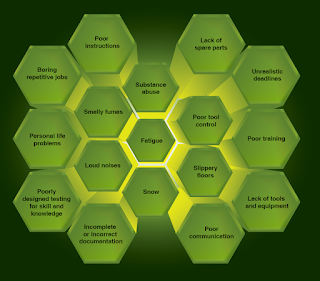 The list of human factors that can affect aviation maintenance and work performance is broad. They encompass a wide range of challenges that influence people very differently as humans do not all have the same capabilities, strengths, weaknesses, or limitations. Unfortunately, aviation maintenance tasks that do not account for the vast amount of human limitations can result in technical error and injuries. 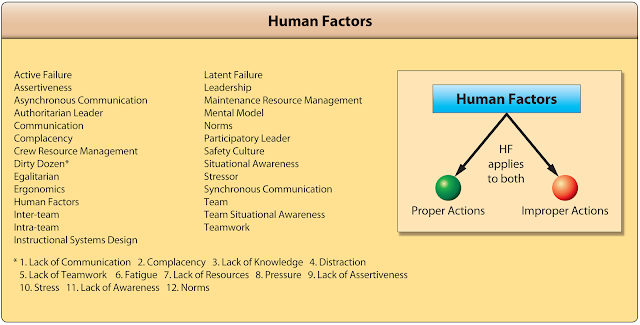 Figure 5 shows some of the human factors that affect AMTs. Some are more serious than others but, in most cases, when you combine three or four of the factors, they create a problem that contributes to an accident or incident. 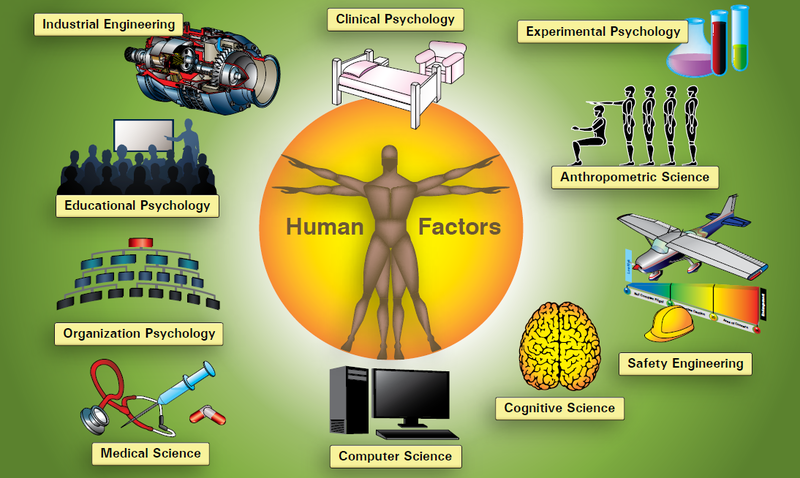 The study and application of human factors is complex because there is not just one simple answer to fix or change how people are affected by certain conditions or situations. 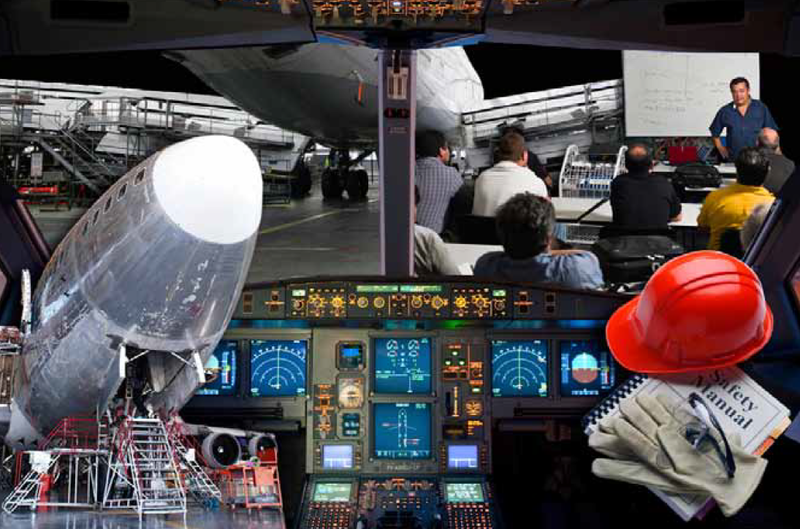 Aviation maintenance human factors research has the overall goal to identify and optimize the factors that affect human performance in maintenance and inspection. The focus initiates on the technician but extends to the entire engineering and technical organization. Research is optimized by incorporating the many disciplines that affect human factors and help to understand how people can work more efficiently and maintain work performance. By understanding each of the disciplines and applying them to different situations or human behaviors, we can correctly recognize potential human factors and address them before they develop into a problem or create a chain of problems that result in an accident or incident. Clinical psychology includes the study and application of psychology for the purpose of understanding, preventing, and relieving psychologically-based distress or dysfunction and to promote subjective well-being and personal development. It focuses on the mental well-being of the individual. Clinical psychology can help individuals deal with stress, coping mechanisms for adverse situations, poor self image, and accepting criticism from coworkers. Experimental psychology includes the study of a variety of basic behavioral processes, often in a laboratory environment. These processes may include learning, sensation, perception, human performance, motivation, memory, language, thinking, and communication, as well as the physiological processes underlying behaviors, such as eating, reading, and problem solving. In an effort to test the efficiency of work policies and procedures, experimental studies help measure performance, productivity, and deficiencies. Anthropometry is the study of the dimensions and abilities of the human body. This is essential to aviation maintenance due to the environment and spaces that AMTs have to work with. For example, a man who is 6 feet 3 inches and weighs 230 pounds may be required to fit into a small crawl space of an aircraft to conduct a repair. Another example is the size and weight of equipment and tools. Men and women are generally on two different spectrums of height and weight. Although both are equally capable of completing the same task with a high level of proficiency, someone who is smaller may be able to perform more efficiently with tools and equipment that is tailored to their size. In other words, one size does not fit all and the term “average person” does not apply when employing such a diverse group of people. The technical definition for computer science is the study of the theoretical foundations of information and computation and of practical techniques for their implementation and application in computer systems. How this relates to aviation maintenance is a lot simpler. As mentioned earlier, AMTs spend as much time documenting repairs as they do performing them. It is important that they have computer work stations that are comfortable and reliable. Software programs and computer-based test equipment should be easy to learn and use, and not intended only for those with a vast level of computer literacy. Cognitive science is the interdisciplinary scientific study of minds as information processors. It includes research on how information is processed (in faculties such as perception, language, reasoning, and emotion), represented, and transformed in a nervous system or machine (e.g., computer). It spans many levels of analysis from low-level learning and decision mechanisms to high-level logic and planning. AMTs must possess a great ability to problem solve quickly and efficiently. They constantly have to troubleshoot a situation and quickly react to it. This can be a viscous cycle creating an enormous amount of stress. The discipline of cognitive science helps us understand how to better assist AMTs during situations that create high levels of stress so that their mental process does not get interrupted and effect their ability to work. Safety engineering assures that a life-critical system behaves as needed even when the component fails. Ideally, safety engineers take an early design of a system, analyze it to find what faults can occur, and then propose safety requirements in design specifications up front and changes to existing systems to make the system safer. Safety cannot be stressed enough when it comes to aviation maintenance, and everyone deserves to work in a safe environment. Safety engineering plays a big role in the design of aviation maintenance facilities, storage containers for toxic materials, equipment used for heavy lifting, and floor designs to ensure no one slips, trips, or falls. In industrial work environments, the guidelines of the Occupational Safety and Health Administration (OSHA) are important. Medicine is the science and art of healing. It encompasses a variety of health care practices evolved to maintain and restore health by the prevention and treatment of illness. Disposition and physical well-being are very important and directly correlated to human factors. Just like people come in many shapes and sizes, they also have very different reactions to situations due to body physiology, physical structures, and biomechanics. Organizational psychologists are concerned with relations between people and work. Their interests include organizational structure and organizational change, workers’ productivity and job satisfaction, consumer behavior, and the selection, placement, training, and development of personnel. Understanding organizational psychology helps aviation maintenance supervisors learn about the points listed below that, if exercised, can enhance the work environment and productivity. Rewards and compensations for workers with good safety records. Motivated workers that want to do well and work safely. Unified work teams and groups that get along and work together to get the job done right. Educational psychologists study how people learn and design the methods and materials used to educate people of all ages. Everyone learns differently and at a different pace. Supervisors should design blocks of instruction that relate to a wide variety of learning styles. Industrial engineering is the organized approach to the study of work. It is important for supervisors to set reasonable work standards that can be met and exceeded. Unrealistic work standards create unnecessary stressors that cause mistakes. It is also beneficial to have an efficient facility layout so that there is room to work. Clean and uncluttered environments enhance work performance. Another aspect of industrial engineering that helps in the understanding of human factors is the statistical analysis of work performance. Concrete data of work performance, whether good or bad, can show the contributing factors that may have been present when the work was done.